Sputnik discussed the new findings with Daniel Kovalik, lawyer and author of "The Plot to Scapegoat Russia" about the air disaster. Sputnik: Why is this investigation taking so long? It’s been so many years. Daniel Kovalik: Well it’s always hard to say, but what we do know is that some of the conclusions that are being reached seem to go against the original narrative that tried to be put forward that somehow Russia was responsible for the downing of the plane and maybe there were folks who were not so eager for that evidence to get out. Sputnik: But there was a first commission that made various conclusions about the pilots actions and their complicity in what led to the crash – why do you think that this new study has found something different? What’s going on? Daniel Kovalik: Originally there was only one theory that it was pilot error that was largely responsible for the crash, and I guess I can’t fully explain why now they’re coming up with this other evidence, but it does put a different gloss on what happened. Sputnik: What are the latest findings by the Polish commission? Daniel Kovalik: They did find some residue of explosives within the plane but none outside of it which, of course, it crashed near the airport in Russia, so what does that suggest? 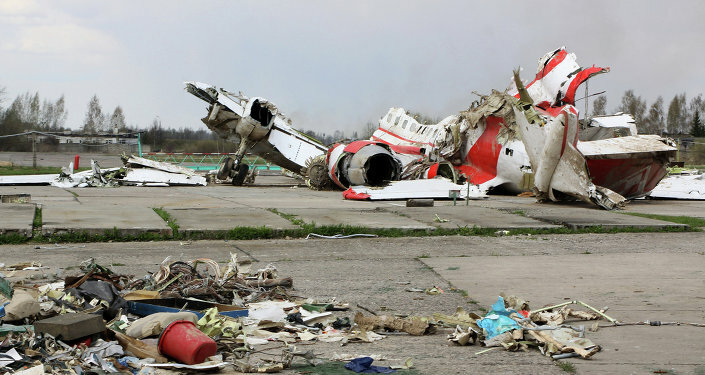 The plane which originated from Poland must’ve had the explosives inside the plane when it left Poland which, again, may be suggestive that someone in Poland sabotaged the plane and not the Russians. Sputnik: The fact that there were no traces of explosives found at the site of the crash means that they were on the plane at this point; when the commission actually revealed its findings regarding this, is there any reason to doubt the fact that they didn’t find any evidence of explosives before? Daniel Kovalik: Obviously one always has to question that. It’s now eight several years later so, of course, one has be skeptical of such findings that occurred so much later, but what we do know is that this is a Polish investigation that is being done by Polish authorities; what motive they would have to frankly find evidence that would more likely point a finger at someone in Poland rather than Russia, it doesn’t seem like they would have such an intention. So given that it seems like the findings have to at least at face value have some credibility. Sputnik: Speaking of motives, who could possibly have had a motive to perpetrate this? I’m just wondering what motives exist, obviously, this Polish commission is eluding to the fact that there was some kind of a Russian motive. What motives could Russia have possibly had? What motives could somebody have had in Poland to get rid of the government and a lot of high-ranking officials at the same time? Who would be interested or would’ve benefited from that kind of scenario? Daniel Kovalik: I honestly never saw what Russian interest would be in doing this. Russia seems to be blamed for pretty much for everything that happens including the recent death of a journalist in Ukraine who turned out not to be dead. In terms of other motives of folks in Poland, obviously the president might’ve had political rivals that might’ve been interested, there could've been criminal elements involved, I guess a lot of that remains to be seen. But what I would like to point out is that I think it’s becoming less likely that the Russian government was involved and I think that really is from an international point of view the most significant aspect of this investigation. Sputnik: What has been the reaction so far by the international media to these findings by the Polish commission and what do you expect the end result of this will be, the findings of the Polish commission? Daniel Kovalik: Well it’s been pretty quiet truthfully in the Western press. I think in part because it is so many years later after the crash happened and also because what has been discovered cuts against the anti-Russia narrative which the Western press seems so hell-bent on promoting. So I think frankly this investigation will probably not be given a lot of attention in the Western press.